Google is rolling out its Knowledge Graph product in Sweden today, allowing users to see a small batch of information related to their search query instantaneously in the sidebar. Knowledge Graph was announced in May last year and launched globally in August – so why it’s taken this long to hit Sweden is anyone’s guess – but the feature has since become a prevalent and valuable part of the Google Search experience. It doesn’t provide any information that isn’t already available on the Web, but Knowledge Graph delivers information quicker and more efficiently than any other search engine on the market. 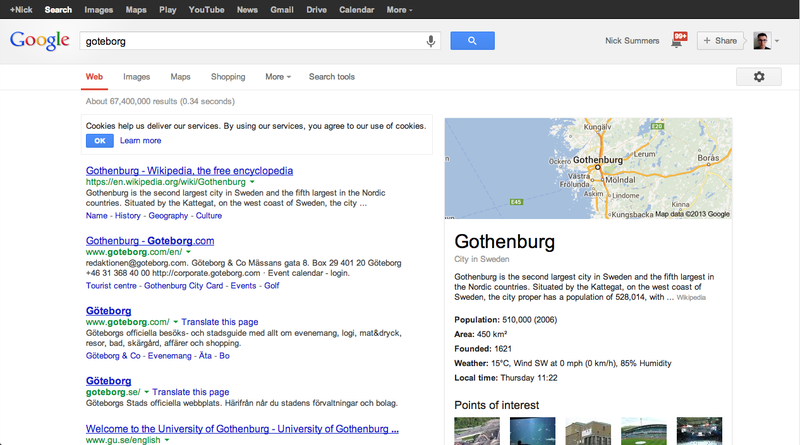 For quick queries, such as finding out the population of Gothenburg, it’s an immediate reference point that sidesteps having to load up a separate webpage or dig down into Google’s various search results. The ‘fact box’ in the sidebar is also useful as an educational tool. It offers a wealth of additional information; for Gothenburg, a link to its position on Google Maps, as well as five points of interest, a link to its Wikipedia page and the current weather forecast. For those who are simply curious to find out more about a particular topic, it’s a perfect starting point. Cities, sports teams, celebrities, buildings, movies, space objects and artwork are all supported in this initial release, with more object types coming in the pipeline. “This is an important first step in building the next generation of search that uses the collective intelligence of the web and understand the world a little more like people do,” Google said in a blog post today. Google expanded Knowledge Graph at its I/O developer conference earlier this year to support queries in Polish, Turkish, Simplified Chinese, and Traditional Chinese. The feature was also expanded in November last year to display medicinal information, including keys facts for the class of drug, related medications, side effects and so on. Most recently, Google added nutritional facts to notify users of the calories, sugar, sodium and more in their favorite food and drinks products. It’s only available for search queries submitted in English, but Google has promised that more languages will be added over time. Knowledge Graph is changing the way in which users discover information. These updates are subtle, but only help to strengthen Google’s dominance in the search engine space. Support for Swedish queries will only help to expand its lead.